We want you to feel very welcome so here is a bit more information about what you can expect at a service. One of our welcome team will greet you at the door and hand you an order of service which will tell you what is going on during the service and also have announcements printed on it. The minister will welcome everyone at the start of the service and will invite any visitors to sign our visitors’ book. We sing hymns and also more modern songs as a way to worship God. This just means it’s a way of showing our thanks to him and expressing how we feel. The words for the songs will be projected on our two screens - hymn books are also available. Most Sundays the organ is used, there is also a praise band with a variety of instruments. Prayer is when we talk to God and a vital part of our church service. At different times in the service we will pray for different areas including prayer for ourselves, for our community and for the wider world. Each service there is a sermon where the minister will teach from a specific passage of the Bible that has been read earlier in the service. The emphasis is on how to apply it to our lives. 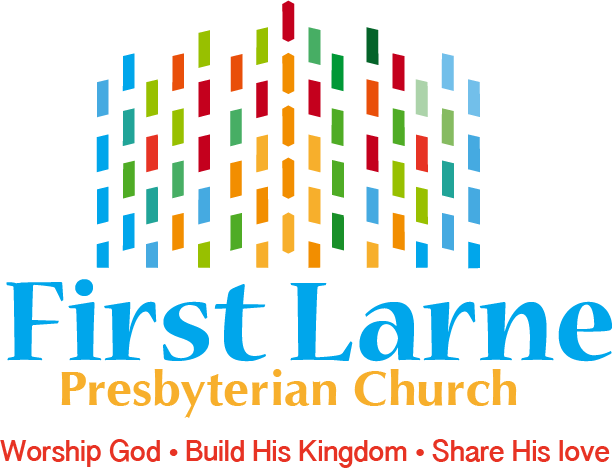 Children are very welcome at First Larne and there are a variety of activities for them to take part in during the morning service. Of course, if want to keep your children with you then you are welcome to do that - although you might find they get more from “Promiseland” or crèche! At some point in the service an offering will be taken and this is a chance for regular members of the church to contribute to the work and mission of the church at home and overseas. They will usually do this by placing their donation in an envelope which has been supplied to them. Some simply place money in the offering plate as it passes from one person to another. However, as many of our members now give by standing order, you will notice some people who simply pass the plate on to the next person.